There are benefits to writing your own thank-you notes that you may not even be aware of. Appreciation can go a long way; others notice when you take the time to personally share your gratitude. 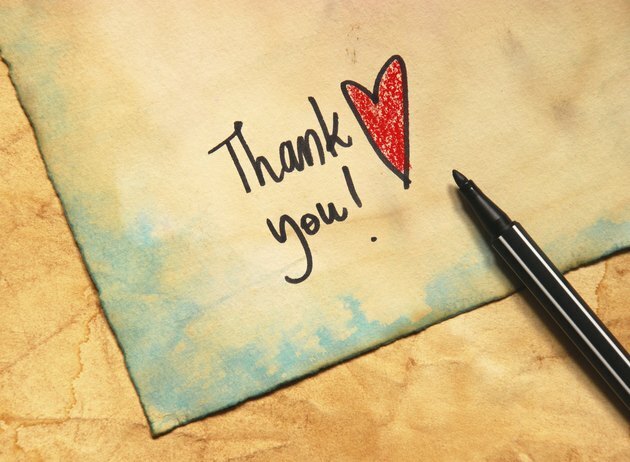 Writing thank-you notes will probably improve your relationship with the giver, prompting more gifts or phone calls. Most importantly, writing thank-you notes is just good manners. Address the person directly. Start with “Dear Grandma” or "Hey PawPaw". If you use a pet name or a nickname for the person, go ahead and use that. Make it personal. Remember to write it; don’t print out a note on the computer. It doesn’t matter what your handwriting looks like; just be as neat as possible. Can’t you just see the tears in Grandma’s eyes as she reads her name in your handwriting? Convey your thanks. This is the time to actually say “thank you”. Don’t say, “I’m just writing to say thank you”; instead try, “Thank you for the hand-knit sweater you made for me.” Express your appreciation for the tangible as well as for the intangible. If it is generosity or hospitality that you’re thankful for, say so. “Your generosity overwhelmed me, thank you.” Or, “My stay at your home was welcoming and warm. Thank you for your hospitality.” Simple and heartfelt is what you’re after. Polish it off with one final note of gratitude. “Thanks again for the sweater. I can’t wait to wear it.” Don’t be afraid to spell out another “thank you”. It's OK to say it one more time. Every gift you receive should be followed with a thank-you. If the giver lives with you, then a handwritten thank-you is not necessary, although a verbal thank-you with a hug is always a nice touch. Keep your thank-you exclusive. Thank-you notes are not the time to discuss your new job or the flu bug that’s going around. It’s about saying thanks and nothing more. It’s OK to have children write their own thank-you notes; you can address and lick the envelopes. Even if it’s only a scribble mark next to your line of thanks, teach your children early on that writing thank-you notes is the right thing to do.